If I had a dollar for every time I said "this is good, however I'd love to see it at a higher proof", I would be a rich, rich man. Well, it's about time, and Master Distillers have listened to our requests, and are recently starting to respond with these awesome cask strength releases! Nose: This is definitely an amped up Maker's Mark! Sweet wheat on the nose with heavy hints of creamy vanilla, caramel, butter, cinnamon, and nutmeg. Taste: Candied red hots with a slight yet sharp burn. The chewy mouthfeel is great, with wheat sweetness up front followed by bold notes of vanilla, butter and cinnamon sticks. There is plenty of sweet spice to keep things interesting on the mid palate. Finish: Long and warming with a spicy, cask strength kick. Conclusion: The first time I tried Maker's Mark Cask Strength bourbon was during my trip to KY for the bourbon trail. We visited Loretta and the beautiful MM Distillery back in October 2014. I remember it being just as sweet, spicy, and delicious. If you are a Maker's fan, this is a must buy bourbon! That being said, at a pricetag of $65, it's hard to keep choosing MMCS over the cheaper yet just as good (dare I say better) Weller Antique 107 proof. Blade and Bow is the latest KY straight bourbon whiskey from Diagio. Two Blade and Bow bourbons were recently released to pay homage to the Stitzel-Weller Distillery. B&B bourbons are unique because they use a Solera system aging process to preserve some of the oldest whiskey stocks. Nose: Pecan pie is the first thing you notice, sweet and delicious. Next is an abundance of red fruits in the form of plums and cherries- almost as if you're walking through an orchard. Caramel and cinnamon are also present, though faint. The flavors blend elegantly and create a lovely bouquet. Taste: Similar to the nose, lots of red fruit soaks onto the tongue for a unique yet pleasant pour. The sweetness presents less on the palate with faint hints of chocolate, candied pecans, and cream- this is due to an overwhelming amount black pepper spice that takes charge and leads its way onto the finish. Finish: The mouthfeel was fairly light so I wasn't surprised by the short length here. The sweet and fruity tones dissipate rather quickly before ending with black pepper spice and a bitter, bitter oak. 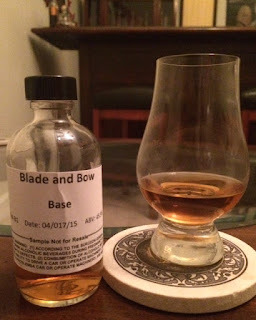 Conclusion: I'll make this one short and sweet: the nose on Blade and Bow is fantastic, the taste is good, and the finish is a huge letdown. If I had to spend $50 on a Diagio product, I'm going to take Bulleit 10 over this everyday. Nose: Caramel, vanilla, and charred oak. Taste: Smooth with a chewy mouthfeel. Baking spices such as cinnamon and clove cover the mid palate. Sharp oak. Finish: Long and slightly bitter. The spice continues but is joined by flavors of pepper and drying oak. Conclusion: There is a huge difference between these two bourbons- we shouldn't be that surprised as they are blended from different sources, but it makes me wonder why they wanted to brand them together. I honestly don't think the DeLuxe is any better or worse than the Base- its just different. That fact that the DeLuxe is $160 makes me sick to my stomach. There are much better things to spend your money on.